I began the project surreptitiously by posing the question “Who is your favorite super heroine?” on my social networks. I took note of the characters people named and started creating a list on my white board, with the left side containing numbers for the days they were released on and the right side a list of potential characters to make. 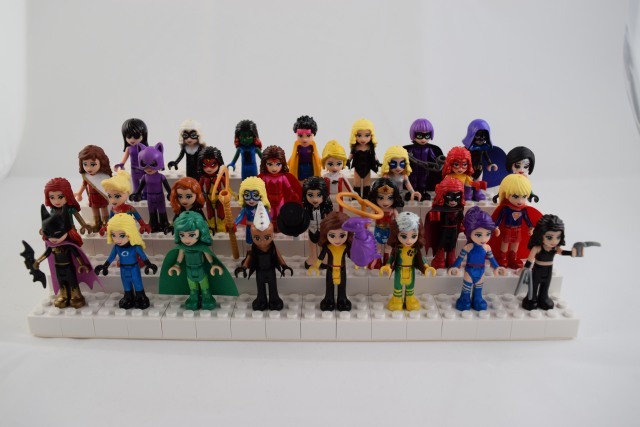 Once I began creating the custom minifigures, I made sure that each fit into the role of super heroine (as some people did request villains), that no character would be repeated in alternate costumes, and that I would release one per day for the entire month of July. I tried to vary the characters to appease to different audiences and keep things interesting for myself by using characters who were well known in the popular culture and those who were lesser known. Once July 1 occurred, it was time to begin displaying my creations. I posted them to my Twitter, Facebook, Google Plus, Instagram, Flickr, and Tumblr accounts in order to reach a wider and more varied audience. As the 31 days passed, I engaged with the audience and was able to keep finding new characters to do or particular variations of characters I was already planning to do. It was a lot of work to do, but I’m proud that I was able to create all 31 in 31. At times it was daunting to find characters to do or have them done in time, but I was able to have them all done and photographed before traveling to BrickFair at the end of the month, where they were on display. Now that the LEGO Super Friends Project is completed, I have thought about the next steps. After talking to people who enjoyed the work over the course of the month, I’ve decided to continue the project, but in another format. It will no longer be daily due to the time commitments that required, so it will become weekly. It will also not only be super heroines, so it will give me a wider breadth of characters to work with – from villains to video game characters to male characters. The focus will still be challenging the stereotypes put forth by the Friends toys. I will also be letting go of some of the figures I have already created. They will be appearing soon in my etsy store, but it also means that future characters may also be commissions (contact me at the link at the top of the page if you’d like to commission any characters that are not currently in the store). For me, the project was a success. I was not only able to challenge the stereotypes put forth by the Friends line, but I was also able to open dialogs about those pink clichés and just reach out to fans of those heroes. I was also able to engage with some of the comic book creators and show them what can be done with their characters and LEGO Friends.